MASQUE is one of those odd little mystery bands that you stumble across sometimes in the world of metal music. The band formed in 1986 in Leicester, England and managed to record a series of demos as well as one EP which was released in 1988, "The Dead Of Night". The album was available only as a vinyl record at the time that was produced in a micro quantity, which essentially meant that there were very few copies to be found. The band broke up shortly after the EP's release and their current status remains a mystery for the most part. No Remorse Records decided to reissue the album in January of 2018 due to the fact that "The Dead Of Night" had achieved a cult status over the years with fans of classic 1980s British Metal. I must admit I didn't know anything at all about MASQUE, but I certainly was curious about their music. Female-fronted bands during the 1980s were something of an oddity in the world of Metal. There were some, but not as nearly as many as there are now. "Twisted Tales" is the first track on the reissue. I will be honest, I hated it. It amounts to 19 seconds of noise. It served no purpose beyond irritation. Next! "Confined Insanity" is a much better track. It begins with a good, strong bass line that blends with the drums quite well followed by guitar riffs that complete the whole thing nicely. Vocalist Amy Casson has a surprisingly strong voice that demands your attention immediately. I didn't expect to like the song as much as I did. It is a great example of what 1980s British Metal should sound like. The third track, "Back With A Vengeance," didn't start nearly as well. The vocals sound flat and forced compared to the previous song. It is a song about vengeance, yet I found myself bored rather than convinced. The music itself is not too bad, but the pacing of the song is all wrong for Casson's vocal style. "The Dead Of The Night" starts out with spooky sound effects which are intended to set the mood, I'm sure. I found it interesting as the music began with powerful guitar riffs and soaring vocals. Then the song focuses far too long on an instrumental interlude that slows the song to a horrible pace. Once again Casson suffers because of the song's speed. "You're through with me, but I'm not through with you" line jumps out at me because that is a line from a QUEENSRYCHE song, "Walk In The Shadows," uh-oh, did someone do that on purpose or was it an honest coincidence?? The song itself is not horrible, but it troubles me for a number of reasons. Not a fan of it. "No Light To Die By" has a long intro which isn't bad at all. Nice, doomy sound that is an improvement already compared to the previous two tracks. Really solid guitar riffs that had me paying much closer attention than I had been. The song really takes off and that's when the vocalist gets to show off at last. The faster pace and the simpler arrangement allowed her to sound GREAT. Now I am beginning to understand why this band has achieved a cult status. The guitarist, Hayden Bedwell, shows off his skills as well by providing a short, but sweet guitar solo just after the middle of the song. This is definitely one of the better tracks on the album. From track six onward the rest of the songs are demos of a couple of the previous tracks as well as few others. Track six is the demo version of "Confined Insanity". I liked the album version of the song, but I like the demo even more. A great deal of MOTORHEAD and GIRLSCHOOL influence could be heard which just set the song off immediately. I love the faster-pace of the song which allowed drummer Chris Young to reveal how well he could play as well as the excellent bass line proved by Pete Jansko. Combined with some great guitar riffs and a terrific vocal performance this song just rocks. "Watch The Children Play" starts out out pretty well and continues that way. Amy Casson provides good, strong vocals to the song which sells the track along with an excellent guitar solo. Another truly great song! The eighth track is "No Light To Die By," and it is so much better than the album version of the song. The speed is much quicker which makes the track sound completely different. It is so good that I wonder why they ever decided to slow it down as much as they did for the album version. The final three tracks on the album are also pleasant surprises. "The Tell Tale Heart" reminds me a great deal an early IRON MAIDEN song and I think that Casson sounds especially good on it. She really can sing when she's given a chance to do so. "Running Wild," the tenth track, is one of the best on the album with its JUDAS PRIEST-like sound. The band is really impressive on it; you can understand why some people in the music industry took notice of them when the band was originally active. I would recommend the track to anyone who is curious about the band since it reveals their skill as musicians about the best. The final track, "Dream Stalker" is lovely instrumental which belongs at the beginning of the album instead of being featured last. 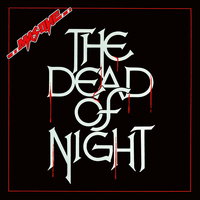 I think the reissue of "The Dead Of Night" would be a good addition for the collection of anyone who is a fan of classic, no-nonsense 1980s British Metal.